Google Chrome Plus is chrome like browser with additional features for windows XP, 2003, vista and windows 7. Google chrome plus is similar to Google Chrome, but with extra features like Double click on tabs to close it, Mouse gestures, Super Drag, Reopen closed tabs, Open Internet Explorer Tab and in-built download managers like NetAnts, Orbit, QQ Xuanfeng, IS, FlashGet3, FlashGetMini, NetX, WebThunder and Xunlei. Click on ‘Settings’ and select ‘Chrome Plus Options’. Here, you will find different options which will customize your Google chrome Plus. 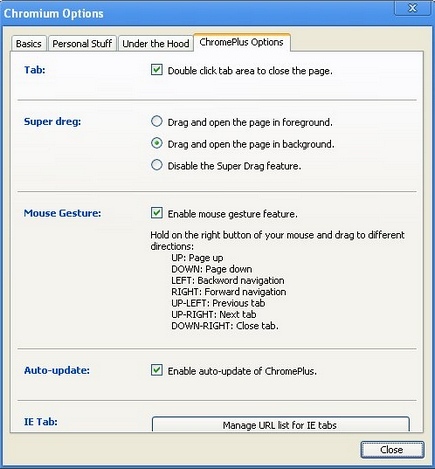 ‘Double click tab area to close the page’, check this option to close tabs with double click. And Mouse gestures to move back and forth. Click on Right mouse button and drag the page backwards, you will be moved to previous page. One of the best features of Google Chrome Plus is to Reopen closed tabs. In case you close any tab by mistake, you can easily reopen it. And there is Super Drag feature which will allow you to drag any links, drop it on to the browser window and open the page in background or foreground. There is a special Internet Explorer Tab, which will open websites that work only Internet Explorer.